Wouldn’t it be helpful to know the questions your executives or clients will ask before they pose them to you? You would have the time to think about the answer and tailor your response for the circumstances. Then, when asked, you could respond immediately and thoughtfully, impressing the interrogator. Well, the presenters at Content Marketing World want to help. 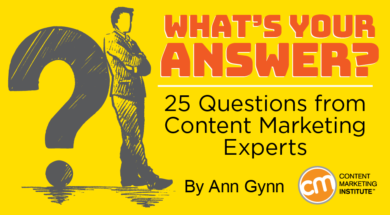 They’re sharing the best questions they’ve been asked about content marketing. In a few cases, they share their answers and in others, we share some content that could help you formulate your answer. But let’s not stop there. How would you answer any or all of them? Include your response in the comments (please label it with the question number for easy reference). And next month, we’ll compile all the questions and answers in an updated blog post. The client who asked this question now actively seeks input into their editorial calendar topics from beyond their industry. Now that the questions have been asked, how would you answer them? Pick one or more and include your response in the comments below. And if you have a great question that was asked and answered (or needs an answer), please add that as well. You can ask questions of these experts and others in person at Content Marketing World Sept. 4-7 in Cleveland, Ohio. Register today and use code BLOG100 to save $100.